A few weeks back, at a soccer game of Maddie’s, I had to go stand way down at the far end of the field behind all the parents on the line. Multiple coaches (I don’t understand why this is needed?) were hollering on the sidelines at the girls. Parents were hollering. All the other games surrounding us…there was hollering. Oh. Did I mention there was a lot of hollering? My fingers itched. I needed to be doing something besides listening to all the hollering and watching the other team score. Yep. I brought my knitting with me! Yay for me! Because I didn’t stress out nearly so much! There was still hollering. And some scoring (by both teams, but mostly the other). But my hands were busy. I can watch a soccer game even though I’m knitting rounds and rounds of stockinette on a sock. And boy did I motor along on this sock! Wow. *Note to self: When you want to speed up your knitting–go to a soccer game and knit! **Second note to self: When you’re feeling a bit stressy–knit! And it will relieve the stress immensely! 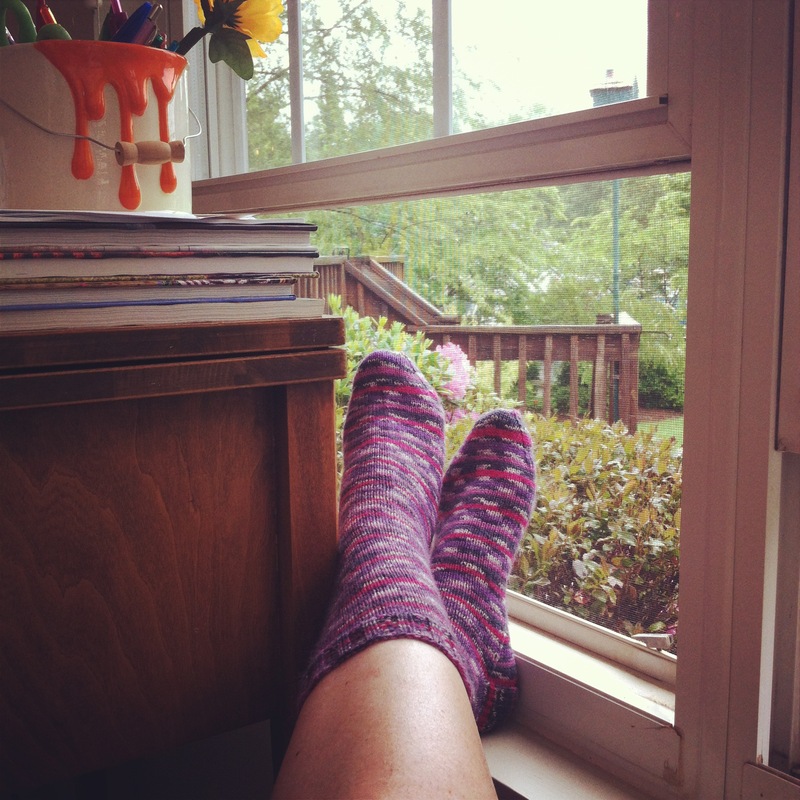 Then when you’ve finished knitting your socks, you can sit back with them cozying your feet. I just giggled when I read this post!! This very idea is the reason I picked up knitting needles. I spend way to much time at ice hockey games. Long tournaments, cold rinks, crazy parents, bad referees(?). In addition to stress relief, my work keeps me warm!!! My brother coached for Little League and I do remember lots of yelling there too. People ate sunflower seeds like crazy so I guess that’s how they dealt with the stress. I think your way works better and is better for you – and your toes. I need to get back to knitting on my socks! I’ve only done a bit of knitting lately as in a couple of rows on my afghan! That’s it but I need to relax some so perhaps I should dust off my needles! Oh that’s funny! Eating sunflower seeds to relieve stress! Sounds very California! Here we might stuff our faces with Krispy. Kreme donuts! I would rather “wear” my stress relieving endeavors on my feet than on my hips! Ha! !